On August 11 at 9:59 UT the Moon meets the Sun in Leo, forming the New Moon. 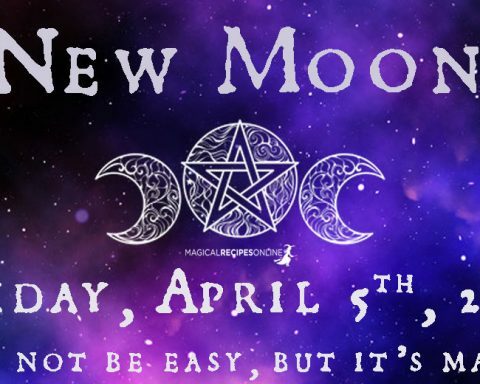 And this New Moon is also a Solar Eclipse and the third and last Eclipse of this Ecliptic Period. The New Moon will also initiate an exactly 18 hours long void of course Moon period, which will last until 3:59 UT of the 12th. 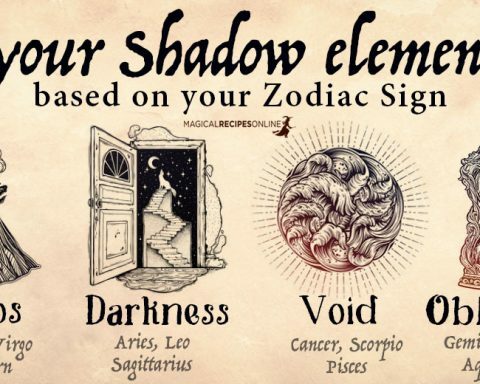 So, my advice is, not only during the void of course period, but also until the Full Moon of the 26th of August, be very careful before initiating new projects, signing new contracts and anything that we usually advice avoiding during the void of course Moon. I’m not saying to avoid them for the waxing period. Just to be more careful and to research things more thoroughly and anything else appropriate for each individual case. Jupiter in Scorpio and the Retrograde Mercury in Leo are also affected quite strongly by the Solar Eclipse. Them being in a square, accurately just a few hours before the Eclipse, makes this effect even stronger. Communications, transportations and their equipment, trade of all kinds, spirituality and the spiritual arts, and all other forms of the arts, as well as the artists receive this pressure. Keep in mind, though, this pressure may take the form of stress and difficulties, but it won’t be necessarily bad. In fact, in most cases, the final outcome will be a beneficial one, as long as we deal with the situations carefully and wisely. Magic will be strong, but maybe a bit uncontrollably so. Communications with the spirits can become intense and not reliable. If you are working your magic with the help of familiars and other spirits, be extra careful and make sure you know exactly what you are doing, exactly what you are asking for, and from whom you are asking it. Choosing the wrong wording, or the wrong (not necessarily bad, but maybe incompatible spirit) can give you undesired results, or results you can’t handle. The moment of the Solar Eclipse 60% of the major planets is in retrograde motion. This, along with the void of course Moon long lasting effect – if you permit the expression – make this Eclipse the most difficult one, on some regards. So, do your best to keep your schedule flexible and do find enough time to rest and relax. Acting should come after a lot of consideration, when possible, but some times this won’t be possible. Keeping our schedules flexible and ourselves well rested means we will most likely have the energy, the time and the clarity of mind to react wisely whenever we don’t have the luxury to take our time to examine the best possible reaction. The good news about that point is that as the days proceed, this effect of the Solar Eclipse calms down significantly. This happens not only because the influence of the Eclipse calms down a bit day by day until the Full Moon, but also because Mercury turns in to direct motion on the 18th. Mars abandoning Aquarius and entering Capricorn, also helps a bit. This is mostly because from there it will form a week conjunction with Pluto. Compared to the previous Eclipses, your mood is much better, your energy levels are higher and your health is stronger. Still, of course, some caution is needed. Overall, this Solar Eclipse is much kinder to you than the previous two. This may not be so true, though, for Aries children. Both Aries children and the children (or children figures) of Aries are going through very significant experiences. These experiences are not necessarily dramatic, or even unexpected, especially for the parents, but for them they are very important and cause them to see the world and themselves from a different point of view. The stress that comes with that is not insignificant. Other than that, mostly those employing some form of art, either as a job or as a hobby, will receive some extra stress from this Solar Eclipse. Changes there can happen, including schools, teachers, and methods. More spiritual advice with your Tarot Card of the Day. Health needs some extra attention under the influence of this Solar Eclipse. In most cases resting enough and properly and relaxing, can help you avoid any other issue. The problem is that work, social obligations and family are trying to steal you rime and energy. Prioritise your resting, though. Also, the actual home, place of living, and in some cases place of working – especially if it’s your own business – may also need your attention. You may have dealt with some of the issues there during the previous eclipses, but, apparently, not all things are in order, yet. On the other side, your spiritual and magical powers seem to be extra strong. Of course, as we’ve seen in the general section, they can be unbalanced, but, nevertheless, make good use of them. More spiritual advice with your Tarot Card of the Day. The Solar Eclipse effects you in similar ways the previous Solar Eclipse did, but maybe a little more intensively so. Transportations, communications and their equipment can all become problematic. Avoid unnecessary transportations and especially so if you are the one driving. If possible, don’t drive at all during the period. If not, be extra careful when you are doing so. Siblings, close friends and neighbours may face – or keep on facing – some problems, changes and dilemmas of many kinds and this stress you, one way or another. Also, students and those in the procedure of learning anything will be affected strongly by the energies of the Solar Eclipse, regarding their studies. Changes in schools, teachers, etc are possible. More spiritual advice with your Tarot Card of the Day. Career seems chaotic and maybe “unfamiliar” in some ways. This may actually happens because you are changing career, place of working or something alike. It’s not necessarily a bad thing, but it’s a stressful situation, and your optimism and confidence may not be quite as strong as you need them to be. Money can cause some stress. Unwise strategies of the past may become obvious now through their negative results. Whatever the case, whichever mistake you’ve been doing in your money affairs and the way you handle money, now will become more clear. Do not be afraid of changing strategies. Instead, do so! If you have some sponsors, or other people who provide you with money, the stress may come to you because of them facing some problems and issues. More spiritual advice with your Tarot Card of the Day. This Solar Eclipse affects you very strongly. All Solar Eclipses do so, as they affect your governor, the Sun, but this one happens in your zodiac, too, where the Sun currently is, as well. So, it’s only natural that it will affect you more. As this Solar Eclipse happens in your first house it can affect all aspects of your life, but mostly it affects the way you see yourself and the way you want others to see you. Redefining these, and changing them, is what you are mostly doing under the influences of the Eclipse. Whatever other aspect of your life is affected, it most probably is so to force you to change yourself. For the better. Your health seems mostly good, but some detoxing or cleansing of some kind may become necessary. In actuality, your body may demand it. This can feel like you are in bad health, but it’s just a necessity to make your overall health better. More spiritual advice with your Tarot Card of the Day. 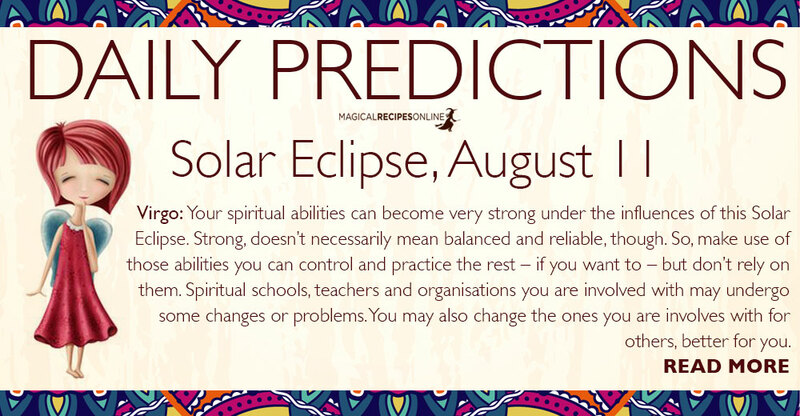 Your spiritual abilities can become very strong under the influences of this Solar Eclipse. Strong, doesn’t necessarily mean balanced and reliable, though. So, make use of those abilities you can control and practice the rest – if you want to – but don’t rely on them. Spiritual schools, teachers and organisations you are involved with may undergo some changes or problems. You may also change the ones you are involves with for others, better for you. When on the 22nd Sun enters your zodiac all these will take their right place and things will be better. Other than that, friends, and relatives may face some financial problems or challenges, but your own financial situation is mostly good. Try, though, to avoid borrowing money you need to others. More spiritual advice with your Tarot Card of the Day. Once again your high-tech equipment is getting under test. Maybe even new stuff you’ve bought recently can act problematically, permanently or occasionally. In the same time, though, form the 13th until the 22nd your ability to select the best such equipment rises, so it’s a good period to purchase such equipment. It’s also a good period to learn more about them and how they work. Your friendships are still not safe, but things are getting better in this field. Family can stress you in many ways. Children may have some problems in their social life, love relationships, or marriages. Parents and parental figures may facing some financial challenges. And family members in general may face some heath problems. Even if this is a psychological issue rather than of the body, keep in mind it may be or feel quite serious for them. More spiritual advice with your Tarot Card of the Day. This Solar Eclipse also challenges your career. Some things change, and some things you have to change. Neither of them is likely to feel pleasant while you are doing it. Amongst these changes, cutting down your personnel is a possibility. Whatever you need to decide, decide it calmingly and wisely, and then follow it with determination. This effect of the eclipse will be active until the next ecliptic period, starting on the 23rd of December. Parents, bosses and other such figures can be stressed in many ways, including receiving slandering. Also, your health needs some attention on your part. Resting enough and properly can help a lot. It can actually be all you need, in most cases. More spiritual advice with your Tarot Card of the Day. Travelling can call for you this period. And, reluctantly, I won’t advice you to avoid it altogether, but try to avoid it the days close to the Solar Eclipse. Other than that, this Eclipse is mostly a reminder of the previous Solar Eclipse. Many patterns are repeating. Students of all kinds, including spiritual students, have more stress to deal with than the rest. 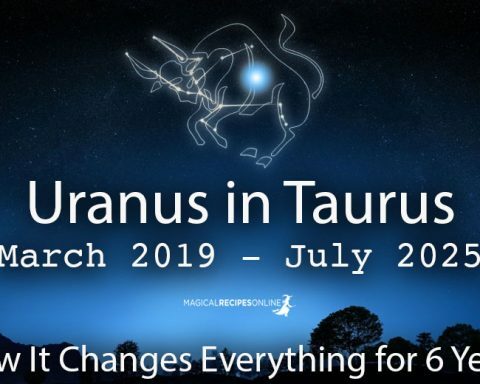 This can produce changes in your studies which can manifest not only during this period, but until the 23rd of December, when the next Ecliptic period will start. Also, siblings and sibling figures may have to deal with some stress regarding their love life, including marriages. More spiritual advice with your Tarot Card of the Day. This Solar Eclipse happens in you 8th house while the general ruler of the 8th house, Pluto, is in your zodiac. The Other World doesn’t seem so distant. In a mundane level, this means you should pay good attention of your health, both physical and psychological. Accidents are possible, depressing thoughts can become strong. Thoughts of death or your beloved departed too. In a more spiritualistic level, this means the dead can contact you, or accept your attempts to contact them. Overall the Solar Eclipse will help you cut distractions, self-restrictions and ways you waste your energy and time, in order to live the life you want. But, this isn’t necessarily a pleasant procedure. But keep that in mind, so that you won’t lose your path. Spouse’s or current love’s finances may undergo a change, willingly or not. If so, it’s likely to be a significant one. More spiritual advice with your Tarot Card of the Day. The Solar Eclipse testes your love life, as did the previous one. Singles are unlikely to create a new, good relationship during this period, although karmic relationships can actually manifest. Those in a relationship may have to deal with much stress in it. Your other half may be burdened by many problems, some of them you may not be aware about. So, try to be calm, patient and understanding. Of course, this doesn’t mean you should lose your self-respect, but quieting down the ego can help a lot. Good and strong relationships have nothing to fear, but those without strong foundations are in real danger. Health also seems sensitive. This effect will start calming down significantly when the Retrograde Mars will leave your zodiac on the 18th. Until at least then, be as careful as you can be, and take good care of yourself. More spiritual advice with your Tarot Card of the Day. This Solar Eclipse seems a lot like a repetition of the previous one, as it affects both work and health in similar ways. In fact, it can also stress them more. So try to be calm and rest well, in order to be able to deal with whatever comes more easily. The good news is, this Solar Eclipse seems to try to conclude the situations there, so it’s more likely that things will have cleaned up until the coming Full Moon. Family members can also stress you in several ways. Mostly children, children figures, and also elder than you relatives, but probably not the parents. More spiritual advice with your Tarot Card of the Day. 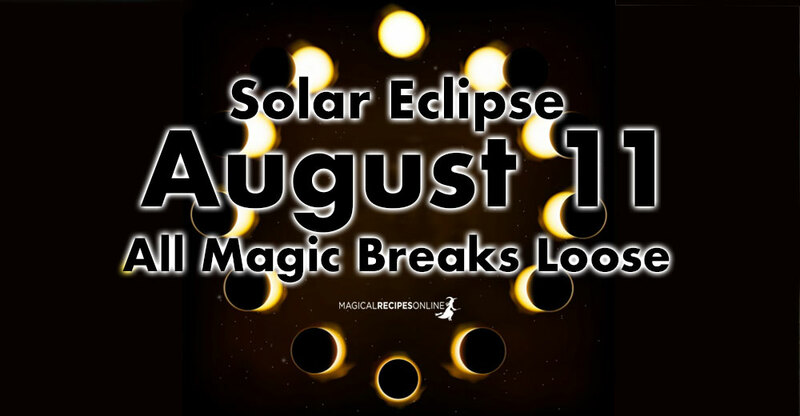 As we’ve seen, all magic is strong under this Solar Eclipse, but avoid anything involving spirits, unless you know very well what you are doing. That’s all. 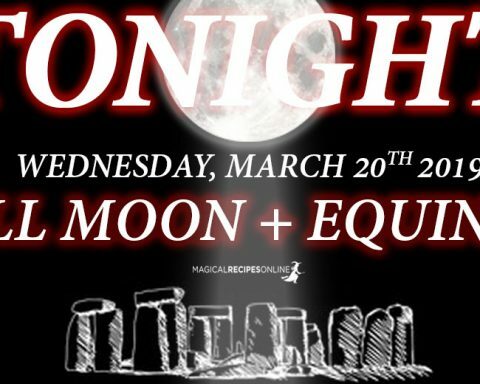 Have fun and enjoy this New Moon and the waxing Moon! Sun 02° Taurus 49' 52"
Moon 21° Sagittarius 19' 57"
Mercury 07° Aries 58' 08"
Venus 03° Aries 08' 54"
Mars 15° Gemini 08' 37"
Previous Story Previous post: Move on! You are not a Tree! Next Story Next post: Perseid Meteor Shower 2018 – Tonight It Will Rain Stars & Fireballs!